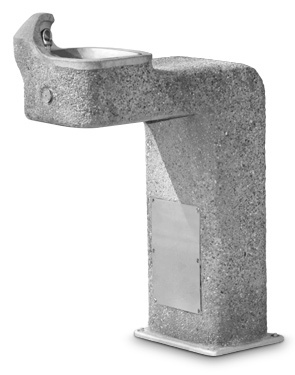 These concrete drinking fountains with exposed aggregate finish are a perfect complement to all outdoor environments. Vandal-resistant features include bubbler hooded by an extension of the precast body to deter bubbler damage and recessed push button. Model 3177 meets current Federal Regulations for the disabled including those in the Americans with Disabilities Act. Haws manufactures drinking fountains, electric water coolers and electric drinking fountains to be lead-free by all known definitions including ANSI/NSF Standard 61, Section 9, California Proposition 65 and the Federal Safe Drinking Water Act. Talk about tough, these rugged models come in vibracast reinforced concrete with exposed aggregate finish. 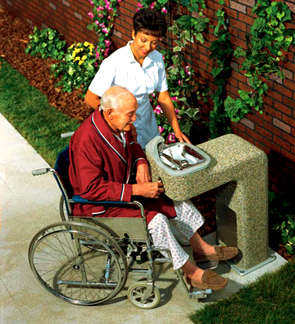 Barrier-free single fountain provides wheelchair accessibility in a contemporary curved design. Recessed push button valve, vandal-resistant bottom plate and concrete bubbler guard. Manufactured with the highest quality cement, select aggregates and sand. Includes recessed push button valve with automatic stream regulation, concrete guard for polished chrome-plated brass bubbler head, stainless steel access plate with vandal-resistant screws and 1/2" NPT screwdriver stop. Waste strainer allows for top down access. Standard color is Portland Gray cement with exposed aggregate finish. The pedestal fountain is reinforced with 1/4" galvanized wire and 1/2" rebar. Cast anodized aluminum mounting plate with four 5/8" dia. mounting holes. Anchor bolts furnished.